Fitness Reality X-Class 710 is undoubtedly a great elliptical trainer you can get within a reasonable budget. Spending a few extra bucks can give you an elliptical trainer that can last for years. The great thing about this elliptical is that it has many of the high-end features. It is ideal for people who want to workout and be competitive in their experience. It is suitable for both high intensity and gradual training. Fitness Reality X-Class 710 is a great investment if you are looking to tone your lower and upper body strength and lose weight. Searching for an elliptical trainer that is more sturdy and durable than the cheap ones? Do you want an elliptical trainer that is reasonably priced and has high-end features? Fitness Reality X Class 710 might be a good fit for you. It is one of the versatile and beginner friendly elliptical trainers you can currently find at $600+. Whether you want to work your heart- low impact cardio or build muscles- total body toning, Fitness Reality X Class can give you varied and challenging workout options. It occupies a floor space of 67”x 24.5” and weighs 154lbs. It is definitely more heavy duty than low-end ellipticals. It can hold up to 300 lbs and comes with 24 levels of resistance. Pedals are angled in the right fashion in comparison to other ellipticals in the market. LCD console display looks bright and clear in the indoors. The LCD console is reflective and has narrow viewing angles. Users have to look straight into it in high light conditions. The electronic controls are less responsive. The buttons have to be pressed for long for the console to respond. Embedded dual console speakers in the console. 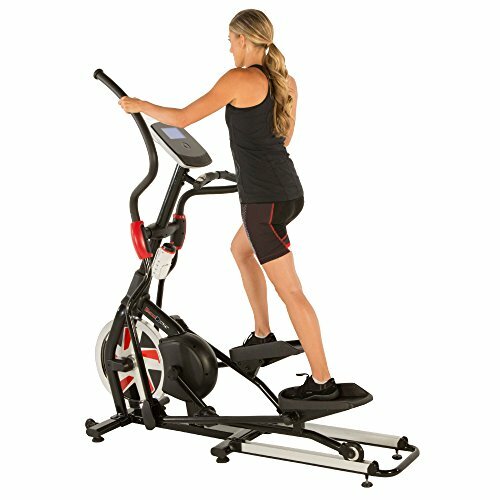 The build quality is perhaps the most important thing to consider when knowing the quality elliptical trainer. Fitness Reality X-Class 710 in this respect is solidly built. All its moving parts are made of high-grade metal which makes it a reliable elliptical trainer for everyday workouts. Parts wise the most important thing that decides the smoothness of the workout is the weight of the flywheel. Fitness Reality X-Class 710 has a flywheel that weighs 44lbs, which is almost double the recommended measure, 22lbs. So working out on this elliptical trainer should be smooth, consistent and comfortable without jerks and irregular movement while pedaling. Also, the larger flywheel of Fitness Reality X-Class 710 gives higher resistance while pedaling to create a realistic pedaling effect. When you accelerate while pedaling, Fitness Reality X-Class 710 would be able to provide you the necessary resistance for challenging and working out your knees, hips, and buttocks. The stride length of 20 inches is exactly what many prefer and is recommended. This will move your legs in a comfortable elliptical pattern, not too wide or closer together to offer you good pedaling comfort. The max weight capacity of Fitness Reality X-Class 710 is 136kgs or 300lbs that falls under the high-end elliptical trainer range. This is quite impressive considering that this is a mid-range elliptical trainer. The setting up of this elliptical trainer takes around 2 hours and the process is well detailed in the instruction guide. Fitness Reality X-Class 710 stays in place and works quietly while pedaling forward or backward. The smooth sliding pedals, good stride length and well-positioned exercise handle provide a good ride feel. It is easy to switch between handles and come back to stationary position for operating the console. Hands stay quite natural and comfortable for the whole time while working out. oothly to give a realistic feel to the workouts. Bluetooth feature is becoming a common feature in the elliptical trainers. While Fitness Reality X-Class 710 has an integrated Bluetooth, you can connect your phone or tablet wirelessly and use it to control this elliptical trainer or listen to music. You can download MyFitQuest app to track your progress during workouts. The app allows you to monitor calories burnt, weight, heart rate, traveled distance, duration of the workout, and average speeds. Moreover, an interesting feature in this elliptical trainer is embedded dual console speakers, using which you can listen to music during your workout session. So no need to plug headphones and be uncomfortable while pedaling. Fitness Reality X-Class 710 features 20 preset workout programs to choose from including interval, cross-country, cross trainer, hill climbing and others. For instance to strengthen your cardiovascular system you can choose cross-country preset. Like most elliptical trainers, Fitness Reality X-Class 710 has a backlit LCD screen. It is quite bright and visible in both bright and dark room settings. The console has a sleek outer appearance and comes embedded with dual speakers. But it lacks some useful features such as cup holder or a reading rack. The other regular parameters such as calories burned, rpm, time, distance, heart rate, speed, and watts are also shown. The manufacturer offers a lifetime warranty on the frame, 2 years on electronics and 5 years on parts and labor. This is decent for a mid-range elliptical trainer. Is the company that makes this elliptical machine still in business? Are they still making this machine? Where is it made? Before I spend money on this I want these questions answered. I don’t want to buy a machine that may not have good customer support if something fails on the machine.